It appears that I'm turning into a total hypochondriac. At least I would be if my aches and pains weren't all so real. 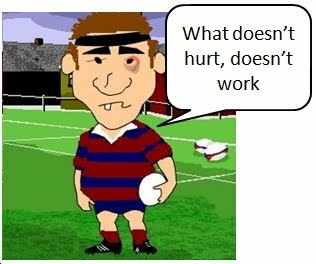 My all too painful pain in the neck continued through Monday, Tuesday and Wednesday, although it was not enough to prevent me charging around in a haphazard manner at Touch Rugby on Tuesday evening. The fact that my performance was unaffected by by inability to move my head from side to side tells you everything you need to know about my Touch Rugby skills. Nevertheless, the Odd Bods triumphed 9-3 in what, so far, is turning out to be a surprisingly successful season. By Thursday the neck pain had gone to be replaced by a persistent ache in my left shoulder blade which radiated down my left arm, a condition which has persisted through the weekend. Note to self: never attempt to self-diagnose via t'interweb - it only leads to further paranoia. The upshot of my various aches and pains and lack of physical conditioning is that I will not be taking part in the Wargrave 10k race next week, something in which I participated last year and for which I had foolishly pencilled myself in again this year. I wouldn't want to burden the organisers with a fatality.